In central India, agriculture is a risky business. As climate change has altered weather patterns and monsoon rains are becoming increasingly unpredictable, a new crop insurance policy promises to use financial management to control the extremes of nature. Early in 2016 the Indian Government, with much fanfare, announced a new crop insurance scheme meant to alleviate the growing risks of agriculture and cure the social ‘ailments’ that purportedly afflict the Indian countryside. It has since become a major political talking-point as well as a significant business, with companies reporting large profits and the government pledging major financial support. The insurance policy covers farmers against misfortune related to farming, such as drought, hailstorms, and pests. Since its introduction, crop insurance has both been heralded by the Modi government as the panacea for the woes of farmers and denounced for being a populist measure which does little to deal with the root causes of rural distress. How does the introduction of crop insurance influence existing relationships and bring about new ones? What happens when the assumptions about farming inherent to this new insurance product encounter the tenacious reality of agriculture in a drought-prone area? 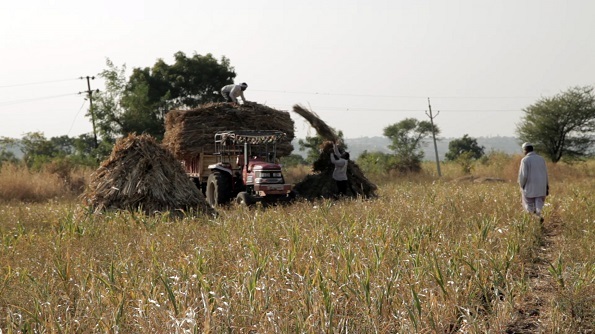 Farmers in rural Maharashtra during the harvest season (photo by Brechtje Boeke). Filmmaker Brechtje Boeke and researcher Tim van de Meerendonk set out to explore some of these questions in December of 2017, to document Tim’s ongoing fieldwork in a small town in rural Maharashtra. We met and spoke to people from various sides of the crop insurance story: a financial consultant, farmers, government officials and village leaders told us about their experiences with the product. The outcome of these conversations, a short documentary, examines what happens when this new crop insurance ‘hits the ground’. What emerges are narratives of distance and arbitrariness. The workings of crop insurance, we find, are experienced as non-transparent and complex. Experts comment that farmers fail to understand the significance, rationale, and procedure of these products, while the intended beneficiaries complain that damage calculations bear little resemblance to the actual damage they experience. Insurance is often explained as something akin to a lottery: an all-or-nothing game with very serious consequences. How do people frame the arbitrary outcomes they experience? Where do they place the responsibility when something goes wrong? What happens when farmers attempt to challenge the insurance companies? The documentary highlights the challenges and potential of this financial instrument to bring the extremes of nature under control and, in the process, reflects on the place of finance in the lives of farmers in India. This documentary is part of the ongoing ethnographic fieldwork by Tim van de Meerendonk on crop insurances in rural Maharashtra, India. The research is part of the Moralising Misfortune project, principal investigator Erik Bähre, funded by the European Research Council (ERC) under the Horizon 2020 Research and Innovation Programme (Grant Agreement No. 682467). Thank you, Arman, for your insightful comments. You are right to say that the senior level perspective is somewhat lacking in this short presentation. We have chosen to primarily focus on the on-the-ground-realities of farmers and how insurance becomes part of their lives. We have done this exactly for the reason you note: Insurance does not expand in a vacuum but is confronted with a set of established economic practices and assumptions which it oftentimes aims to transform or counter. As an anthropologist, to me it are exactly these blurry and contradictory spaces that are most exciting as it is here that human ingenuity manifests itself. I agree with you that there is considerable potential for insurance as a means to a more equitable redistribution of resources. The more reason to keep a critical yet constructive eye on its practical consequences for farmers. Shekar, thank you for your reply! You are right in saying that it is very diverse and colorful palette of players. I think this resembles the reality of governance in many new government projects in rural India. There is a trend among farmers to first of all hold the government accountable for misfortune, for which they seem to have an established repertoire of discursive and representational strategies. At the same time the introduction of private insurance into the development mix, to a certain extent, re-imagines farmers as ‘customers’. This shift, in its turn, reshuffles accountability and responsibility and is accompanied by a considerable mistrust surrounding the ethics of formalized business. In any case, as you say: Plenty of room for social scientists to explore and unpack the complexity of the relationships and meanings that insurance creates. Based on the interviews i feel that there is a lot of work for social scientists. The communication between the involved players is poor. Expectations on the product is very varied and this is because of lack of proper extension. Some farmers are clearly lying and want to make an extra buck. I like the study and lookforward for updates on the progress. Good effort. Pity there wasn’t a senior level perspective from the supply side. Most of the demand side issues are behavioral. Also they tend to mix several other issues like money lenders, etc. So the solution lies in creating better awareness about the concept and not just the product, utmost transparency about claims settlement, risk-sharing by farmers to ensure better ownership and addressing the behavioral issues effectively. The positive note on which the film ends needs to be maintained somehow.